The Cabinetmaker, Inc offers a full range of woodworking classes through Barnard Woodworking School that result in a beautiful piece of Greene and Greene-, Mission- or Shaker-style furniture and cabinets (to name a few). We also offer special private classes for the project of your choice. Whether you are new to woodworking or looking to hone your skills, Dale Barnard works one on one with each student, in a small class setting, to provide the guidance you need. Listed are our classes held at Barnard Woodworking School. 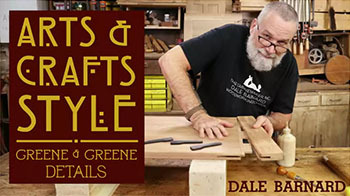 Dale also teaches online classes at Craftys.com and on DVD available for purchase through our store tab or The Great Courses or Popular Woodworking Magazine Videos.